The development of Perry Meridian can be seen in different aspects of the school. Following the growth of the students comes the teachers, whose time put into the school is shown in clubs, hallways, classrooms, or, in English and photography teacher Jacqui Sheehan’s experience, all of the above. “It’s enjoyable for me to give other people enjoyable opportunities. Part of my purpose as a human is to help people grow and find what their passionate about. That’s actually fun for me,” she explains, reflecting on the memories she has made throughout her teaching career. Sheehan is only one of many other teachers in the building who dedicate their time to the school, helping with a variety of Perry events, such as Homecoming, Mr. Falcon, and the annual class competitions. So much of Sheehan’s time is spent in the school that she feels one could not separate her personality from the teacher that students see every day. Sheehan’s time at Perry started 16 years ago after attending Southport High School and graduating from Indiana University. She student taught for former English teacher Carol Fischer, and states that many of Fischer’s teaching methods appear in her own lesson plans today. The “legend,” as Sheehan puts it, is how she got her start for wanting to bring out school spirit in the Best High School in the World. In her early years of teaching, Sheehan was involved in no clubs or activities but slowly made her mark one event at a time, starting with becoming a sponsor for National Honors Society during her early years in the building. She now sponsors CWC, which puts out events like PB&J, the Literary Magazine and Falcon Expression in Student Theatre (FEST). Her ‘baby,’ however, is student government, or StuVo. In StuVo’s first year of transition from student government to student voice, Sheehan was asked to give a brief speech on camaraderie and expectations in the club devoted to leadership and over the years has become a prominent sponsor for the club that puts on homecoming, prom, and class competitions. But why? Why put so much time into the school to the point where friends come second to taking senior pictures? Sheehan explains that a personal goal of hers is to be a guide for her students throughout their high school careers. Her relationship with students deeply impacts their years in high school, as proven by junior Clair Marlatt, who has had Sheehan as a teacher for three years now. Her influence on the school has also found its way to the teachers. 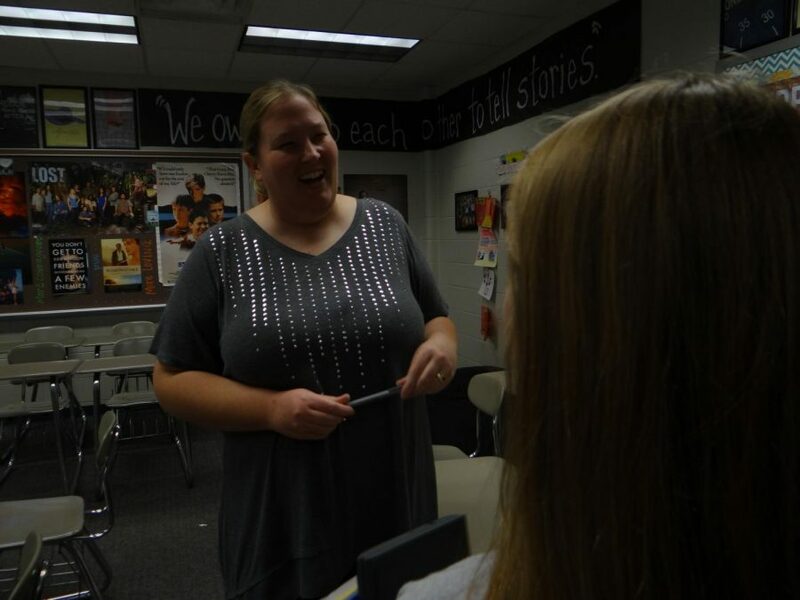 Her involvement in StuVo and CWC has allowed her to become close with biology teacher Nikki Knight, helping create the current quality of the school’s class competitions. “We work as a team because we are very different in personality, yet we both have passion for what we do,” says Sheehan. The English teacher’s own personality trait of being a self proclaimed “control freak” has been challenged by her commitment with working with other teachers, but in a way has helped keep everything she is associated with to a certain level of expectation. With students eating lunch in her classroom every day and the series of senior pictures she gives to students at a discount, her impact on her kids going forward with their lives does not always get gratification, but that does not sway her passion for her position.